Gateway Station is an Omega Series Starbase that was constructed in the Bajoran System as a replacement for Deep Space 9. In 2413 the Federation Station Deep Space 9 was visited by a group of Bajoran scholars whom had located a mysterious relic while studying the ancient city of B'Hala. During the investigation, which was assisted by Science Officers from the Starship Enterprise, a mysterious energy was released by the artifact that infected the computer systems of the station. Facing multiple system failures the Station Crew desperately tried to stay ahead of the virus and restore the station. When close to eradicating the virus an unexpected complication arose. The transporter system of the station began a rematerialization sequence that brought Gul Dukat aboard the station. The former Cardassian had been bonded with an organism known as a Pah'wraith, which had given Dukat enhanced abilities. Believing himself to be the Emissary of the Pah'Wraith, Dukat began his efforts to subjugate the Bajorans and initiated the Station's counter insurgency program. To counter this the starships Defiant and Enterprise engaged the station in combat to distract Dukat while Deep Space Nine's crew attempted to retake the station. Unfortunately it quickly became clear that the Station would not be recoverable. Instead Captain James Kurland chose to engage the Station's Self Destruct System with a zero second delay rather than allow Dukat to conquer Bajor. Due to the strategic importance of the Bajoran Wormhole as a gateway to the Gamma Quadrant, Starfleet ordered the immediate construction of a replacement station in the Bajoran System. 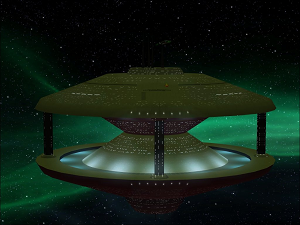 By order of the Federation Council it was decided that an Omega Series Starbase would be constructed to replace Deep Space Nine. In honor of its predecessor and its importance in Federation history it was decided to give the station the designator 419 - the number 4 representing the letter D and 19 representing the letter S in the abbreviation DS9. Construction continued apace with a focus on establishing the outpost as quickly as possible in order to defend the Bajor Sector in the event of potential invasion due to the wormhole. Following the devastating attacks by the Supremacy on the United Federation of Planets, the Klingon Empire, and the Romulan Republic, Starfleet faced a shortage of resources for continuation of construction on Starbase 419 as material was transferred to the Core Sectors to rebuild. In its current condition the Upper Docking Garage and support structures had been completed and work was in progress on the Lower Docking Garage when the loss of resources took place. Despite its unfinished status, Starfleet Headquarters authorized the Starbase to be christened in its uncompleted state with further efforts to occur on completion of its lower section over time. Formally named Gateway Station, Starbase 419 came online in November 2418 at a ceremony presided over by President C'Tuur and was placed under the command of Captain Nog. Many former merchants from Deep Space Nine also chose to reestablish themselves on the station in honor of their former home, with a crystalline statue of the Nor Series Deep Space Nine located centrally in the Grand Concourse. The recently refitted Starship Defiant returned to the station as mission support vessel during its christening, relieving the USS Yorktown of this responsibility. The short life of the station has been eventful in its role as gateway to the Gamma Quadrant. The Station has seen frequent usage for its exceptional construction facilities and has been used in several high profile assignments. The Station was a center of controversy in 2424 when it was discovered that the Lower Docking Garage was in fact complete and was being used by Section 31 as a base of operations. Teams from Starfleet Intelligence were able to uncover information regarding multiple ongoing operations undertaken by 31 including Project Longshot, Project Shard and Project White Knight. The details of these projects were ordered classified by the Federation Council and Starfleet Headquarters. This action deeply impacted the Bajorans and multiple requests by the Bajoran government for a formal investigation into these projects were denied citing Federation Security. Presently, Gateway Station remains operational under the leadership of Captain Alea Parsons - whom assumed command following Captain Nog's transfer to direct the Corps of Engineers. The Communications room monitors all communications that are routed through the systems of Gateway Station and then transmitted to their destination. Bajoran Space Central monitors and coordinates all vessels operating within the Bajor Sector. The primary command and control room for Gateway Station, the Operations Center is the station's equivalent of a starship's Bridge. Gateway Station's drydock is the largest location aboard the entire station and allows for starships to dock inside the station for repairs and replenishment as needed. Attached to the Spaceflight Terminal, the Promenade is the main shopping center for Gateway Station. Entertainment including bars, holosuites, restaurants, and shopping plazas are in this area for staff and visitors to Gateway Station. This area was authorized to be renamed the Promenade in honor of the facility aboard Deep Space 9. The primary point of entry for Gateway Station, the Spaceflight Terminal is one of the largest areas aboard the station. From here crew and passengers can gain entry to any vessel that is docked at the station. Security personnel are constantly on patrol in this area and screen all persons who enter and leave Gateway Station. The Lab Complex for Gateway Station is one of the largest sections of the station and features extensive labs of various types for the use by the science personnel whom reside on the station. Due to the extreme nature of some research undertaken there most labs can be ejected from the station if the need arises in order to contain a catastrophe. Personnel quarters have been installed in this region for the scientific complement of the station to ensure that they are close to their workstations should they be called to action. The advanced sensors of Gateway Station have been installed in this region of the station. The medical center for Gateway Station. The Hospital Complex is the primary trauma center for the Bajor Sector and features capabilities to treat over 10,000 patients per day. The Hospital itself features an Ambulance Bay for medical shuttles, patient wards, psychiatric offices, and surgical rooms. Quarters are available for the medical staff in this area. The primary energy generation center for Gateway Station are a series of powerful fusion reactors that have been installed in this area. Gateway Station was created as part of the Section 31 arc of Continuing Voyages and remains a frequent NPC Station and is support station for the USS Valhalla game.